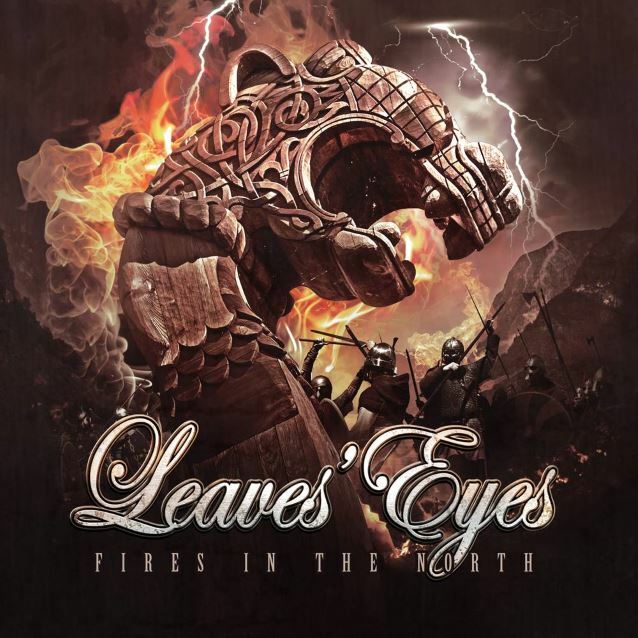 LEAVES' EYES will release a new EP, "Fires In The North", in Europe on October 7 and in the U.S. on November 4 via AFM Records. The band says: "The brand new song 'Fires In The North' is an epic rocker! We can't wait for you to hear it!" The cover artwork of "Fires In The North" was created by Stefan Heilemann and can be seen below. LEAVES' EYES made its live debut with new singer Elina Siirala on April 17 at the Hammersonic festival in Jakarta, Indonesia. The remaining members of LEAVES' EYES and their former singer, Liv Kristine, have offered different accounts of the circumstances behind their split, with LEAVES' EYES claiming the decision to part ways was amicably made in January and Liv saying she was dismissed from the group on April 6. LEAVES' EYES guitarist Thorsten "Tosso" Bauer told Russia's Rock Cor: "When Liv and Alex [Krull, LEAVES' EYES' co-vocalist and Liv's husband] split up personally early January, Liv wanted to leave the band right away. But Alex convinced her to stay with the band and they both made a very good agreement with each other for their private life and business. So the band situation seemed to be solved at that point of time. But since February her new fiancé/therapist tried to interfere in a lot of band matters. He talked very bad about LEAVES' EYES and that shows, tours and interviews shouldn't happen without him anymore. Her fiancé/therapist even told Liv to step aside from the band. In March, things went far beyond after Liv moved to her engaged therapist and it became very clear to everybody in the band that we will go separate ways in the future. Liv also wanted to be involved in picking the new singer for LEAVES' EYES. We told her that we want to decide ourselves who will be our new singer in the band. So there has nothing been happening behind anybody's back. "Beginning of April, we had a band meeting to talk about how things go on. In the meeting, we decided together to go separate ways immediately. Liv told us she is not able to fulfill her touring commitments with the band anymore for personal reasons. Moreover, Liv's lawyer wrote in a letter to Alex that a further cooperation including the live shows with the band is not possible for Liv anymore. So Liv was relieved not having to play any future shows with LEAVES' EYES. As a result of the meeting, we also set up a press statement together with Liv, to inform the fans and media. To the surprise of everybody, this first press statement we set up together was attacked soon after by several additional posts and statements from Liv. Suddenly other people and 'trolls' started to spread nasty rumors and lies on the Internet. That was the reason for the confusion and anger in April. "For myself I can clearly say, if anyone in the band would have treated Liv in the way some trolls in the internet tell, I wouldn't be part of this band anymore. Also, I can say that Alex is a single father at the moment, and since Liv and Alex separated from each other, their son lives at his place." An earbook tour edition of LEAVES' EYES' latest album, "King Of Kings", was released in June, including a new version and video for the song "Edge Of Steel", featuring Elina.